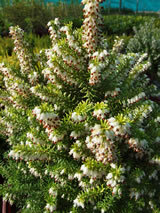 Compact shrub with a rounded conical shape. Pretty golden yellow leaves all year around. In winter and spring it has white bell-like flowers with red anthers. This plant is hardy to cold and frost but prefers semi shade and free draining, lime free soil. Avoid very dry sites. Great winter colour in the garden.